Dynamite Entertainment is set to launch a brand new series written by acclaimed storyteller Ron Marz (Green Lantern, Silver Surfer, Witchblade), with exquisite art by Roberto Castro (Red Sonja, Flash Gordon) as a new hero rises in…Turok! “We’ve seen a few variations on Turok over the years, but what Ron’s doing here is both true to the roots of the character while threading together an even larger narrative which I think will be satisfying to both Turok fans and new readers alike. And based on what Roberto’s done so far, I think readers are in for a treat,” said senior editor Matt Idelson. The first issue of Turok delivers a wide selection of cover variants, providing fans and retailers a chance to collect the whole set! The cover artwork features the talents of Bart Sears (Turok), Butch Guice (Captain America), Jeffrey Veregge (Transformers), and Roberto Castro (Red Sonja/Conan) respectively. Turok #1 will be solicited in Diamond Comic Distributors’ November 2018 Previews catalog, the premier source of merchandise for the comic book specialty market, and slated for release in January 2019. 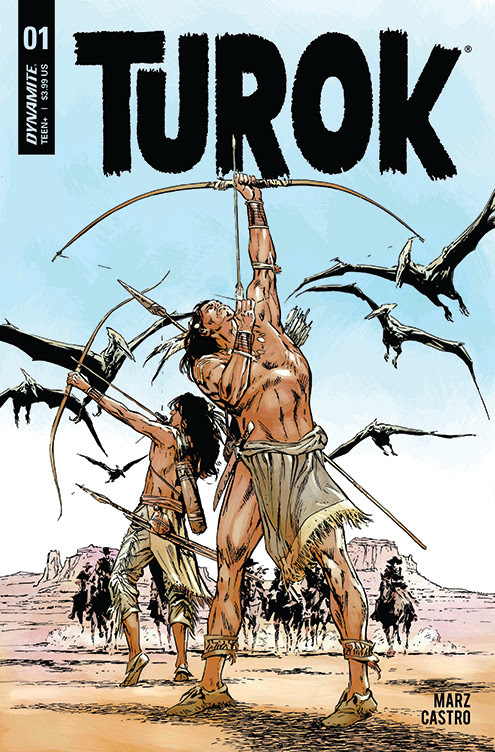 Comic book fans are encouraged to reserve copies of Turok #1 with their local comic book retailers. Turok #1 will also be available for individual customer purchase through digital platforms courtesy of Comixology, Kindle, iBooks, Google Play, Dynamite Digital, iVerse, Madefire, and Dark Horse Digital.